What is it like at the South Pole? one of the most extreme places on earth to be occupied. For thousands of years, the South Pole was only imagined in theory, no-one even saw the continent of Antarctica that surrounds it until 1820. Today there is a busy scientific community and even visits by tourists. This page is about the actual South Pole, that is the point at 90 degrees latitude south or simply 90°S, the Geographic South Pole, also known as the Terrestrial South Pole. Along with the Geographical North Pole at 90°N, it defines the points on the earth's surface where the axis of rotation meets the surface or the place through which an imaginary line around which the earth spins passes. The whole of Antarctica is often known colloquially as "The South Pole", here we are being more geographically restrictive. Where is the South Pole, What is There? The pole is situated about 1,300km (800 miles) inland from the nearest open sea, it is at an altitude of 2,835m (9,300ft) above sea level due to the enormous thickness of the Antarctic ice sheet. The bedrock at the pole is thought to actually be about 57m (187ft) below sea level. At the surface at the South Pole, there is just snow and ice, there are no other natural significant features, no mountains sticking through the ice (there are hills and mountains beneath the ice, but they aren't tall enough to reach through) no rock, no solid ground, just a vast endless plateau of more snow and more ice. Oh yes, and a huge human settlement that is the Amundsen-Scott South Pole Station. This American run scientific station was established in 1956 and has been permanently manned ever since then. The current station is the third to be built, work started on it in 2003. In addition to the main station building there is a large collection of other structures in the area. Some are specifically designed and constructed scientific buildings, others are sturdy insulated tents that are used for temporary summer-only accommodation. There are cabooses or converted shipping containers that are fitted out for a particular purpose or scientific experiment. View from balcony at one end of the South Pole Station to the less pretty stuff at the South Pole - hypertats (blue) temporary summer accommodation, Twin Otter (aircraft) parking (behind red containers), Construction Camp, the Berms (lines of cargo), and Communications buildings (sphere is RF building). The 10 meter telescope and Dark Sector Laboratory (DSL) to investigate dark matter and dark energy. The actual South Pole. The red-and-white striped pole with the mirrored ball is the Ceremonial Pole. The Geographic Pole is the bronze marker on a silver rod. The Geographic Pole is moved about 10 meters every year, as the ice cap moves and carries the marker with it. The Ceremonial Pole is only moved when necessary. The Amundsen-Scott Station is behind the poles. 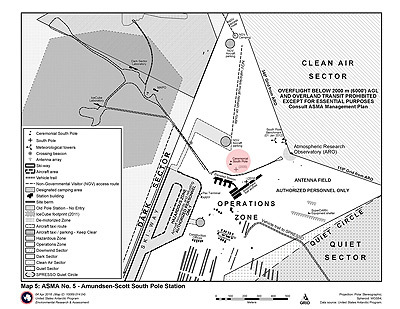 The South Pole Station Map. "Dark Sector" is protected from light pollution and electromagnetic radiation from the base for the use of telescopes, "Clean Air" is free (mostly) of exhaust fumes, "Quiet Sector" is away from any vehicles and noise where very sensitive seisomological instruments are located. Does it Snow at the South Pole? Snow does accumulate at the South Pole, but it is not always from snowfall, atmospheric conditions can cause ice crystals to fall from what appears to be a clear sky, these accumulate just as snow fall does. 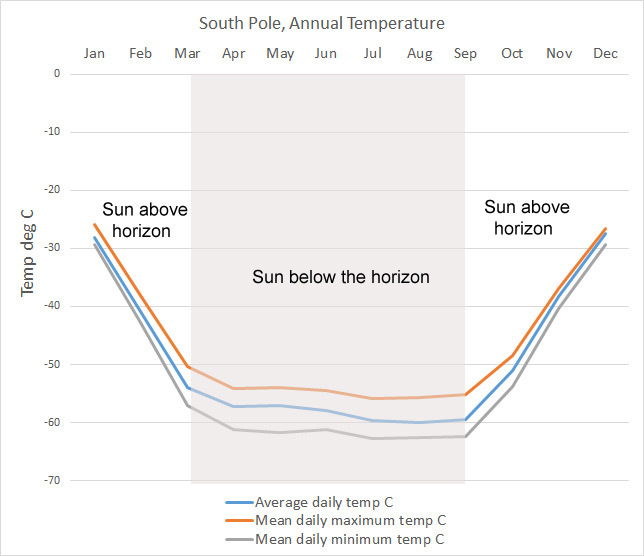 The following explanation comes from Rusty Kapela who was lucky enough to spend 3 months at the South Pole as a graduate student assistant meteorologist. As you know, the interior part of Antarctica is much colder than the coastal areas which are moderated by the "heat" released by the oceans. On most days in the interior the ground cools dramatically due to radiational cooling (heat escapes upward from the ground/snow surface). Therefore, the air temperature just above the ground undergoes extreme cooling since the snow surface is cooling most of the time, especially in winter. However, a layer of air only a few hundred to perhaps a thousand feet or so above the snow/ice surface doesn't cool as much or as fast as the snow surface itself. The result is a reversal of the air temperature as one goes up from the snow surface. This reversal is known as an inversion. Air temperatures in the inversion may be 10 to 25 degrees C warmer than surface temperatures. Above the inversion temperatures become colder again. Vehicles - Re-Arranging the Snow at the South Pole. Snow builds up in the wrong place and gets in the way, there's something appealing about the notion of people being sent to the South Pole to re-arrange the snow. Snow build up around the station. There is also a large pile of snow to the right of the station that has been dumped there after being dug out from where it wasn't wanted. There's surplus snow at the South Pole - who knew?! Keep in mind that "warmer" air can potentially hold more moisture than colder air. Therefore, greater amounts of moisture are found within the inversion. The relative greater amounts of moisture in the inversion ultimately precipitates out as ice crystals. However, there isn't enough moisture in the inversion to form clouds that humans can see. On some days the ice crystal fallout becomes more intense and can actually reduce the horizontal surface visibility down to below 1 mile and in extreme cases down to 1/4 mile. When this happens it make look like there is a haze near the ground reducing visibilities - but in fact it's ice crystals. Surface visibilities below 1 mile can affect the takeoffs and landings of airplanes. When I was at the South Pole, I noticed that the more intense ice crystal fallouts occurred when the surface winds were blowing from lower to higher elevations from the Weddell Sea area up to the South Pole. In these cases the inversion and it's moisture were undergoing additional "squeezing and cooling" due to the upslope flow. Air cools as it goes uphill and it can't hold as much moisture as it originally did. This squeezing/cooling forces moisture within the inversion to precipitate out more intensely as ice crystals. The opposite was true if surface winds were blowing downhill/downslope from the higher Eastern Antarctica plateau area - .better visibilities and less intense ice crystal fallouts or no ice crystals. About 60-80mm / 3" per of snow/ice builds up at the pole every year, none of this melts so buildings become buried over time, wind blown snow forms drifts and tails around buildings, so the build-up can be significantly greater than the accumulation alone would imply. As you may imagine, such an unusual place as the South Pole has some peculiarities, here are some of them. The sun rises once a year at the South Pole, it then stays above the horizon for 6 months before setting and remaining set for the next 6 months. It rises at the September equinox on the 21st and sets just after the March equinox on the 23rd. The temperature reflects whether the sun is above the horizon and how far above it gets. At the equator, you are moving at a speed of 1,037 mph due to the rotation of the earth. Sydney, 33.9 degrees South - 864 mph. New York, 40.7 degrees North - 790 mph. London, 51.5 degrees North - 649 mph. Northern tip of Greenland, 83.6 degrees North - 116 mph. If you lay down so your navel was directly over the point of the South Pole, in a day, you would do a complete 360 revolution (with head and feet occupying time zones 12 hours apart). All time zones converge at the poles, so in a sense it is whatever time you want it to be. You might think you could take your cue from the sunrise and set and so use that, except that doesn't work as the sun unhelpfully only rises and sets once a year. The time at the South Pole is taken as being the most convenient for the people on the station there, which is New Zealand time as that is the main supply base, so the time at the South Pole is UTC +12. There has arisen a tradition at the American Amundsen/Scott base at the South Pole for a "Race Around the World" that takes place on Christmas Day. All manner of transport is used to travel around the geographic South Pole so meaning that in passing through all time zones and lines of Longitude, the participants have raced around the world. The course actually goes around three times and covers two miles. 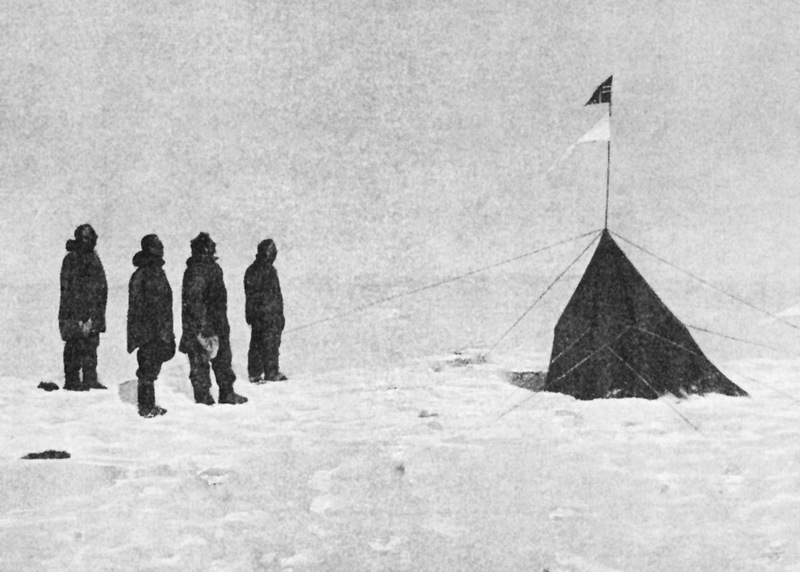 Despite being a featureless flat bit of ice and snow surrounded by identical looking featureless ice and snow for hundreds of miles (at least) in all directions, the South Pole was a very sought after geographical prize, after several attempt to reach it, Norwegian Roald Amundsen arrived there first as part of a team of 5 men with 18 dogs pulling sledges on the 14th of December 1911. 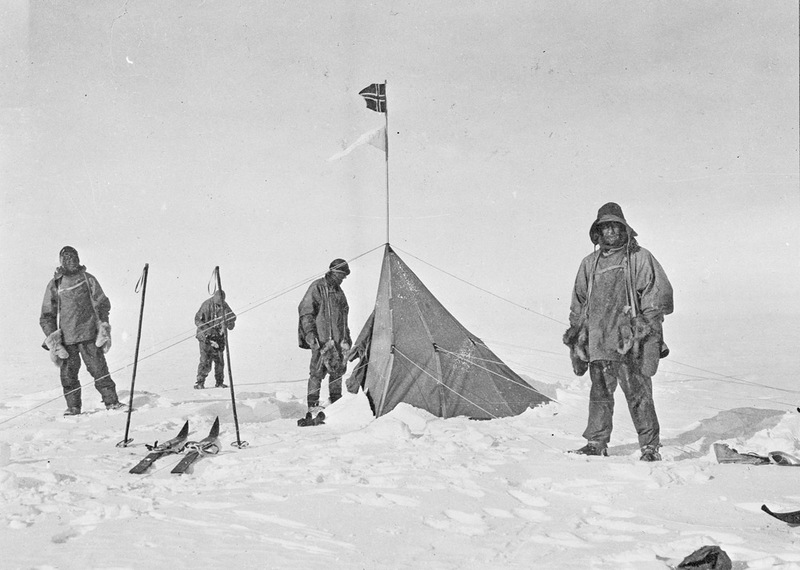 Just over a month later Englishman Robert Scott also reached the pole with a team of 5 men having manhauled there. While Amundsen's team all returned home safely, Scott and his men died on the way back from the pole. 14th December 1911, Friday, about 3 p.m. - Roald Amundsen arrives with 4 other men and 18 sled dogs. 18th January, 1912 - Robert Scott arrives with 4 other men to find they have been beaten to the pole by about a month. November 29th, 1929 - Admiral Richard E. Byrd, and 3 others fly over the South Pole. They fly around a bit to make sure they reached it. October 31st 1956 - Admiral George J. Dufek of the US Navy lands in a transport plane named "Que Sera Sera". 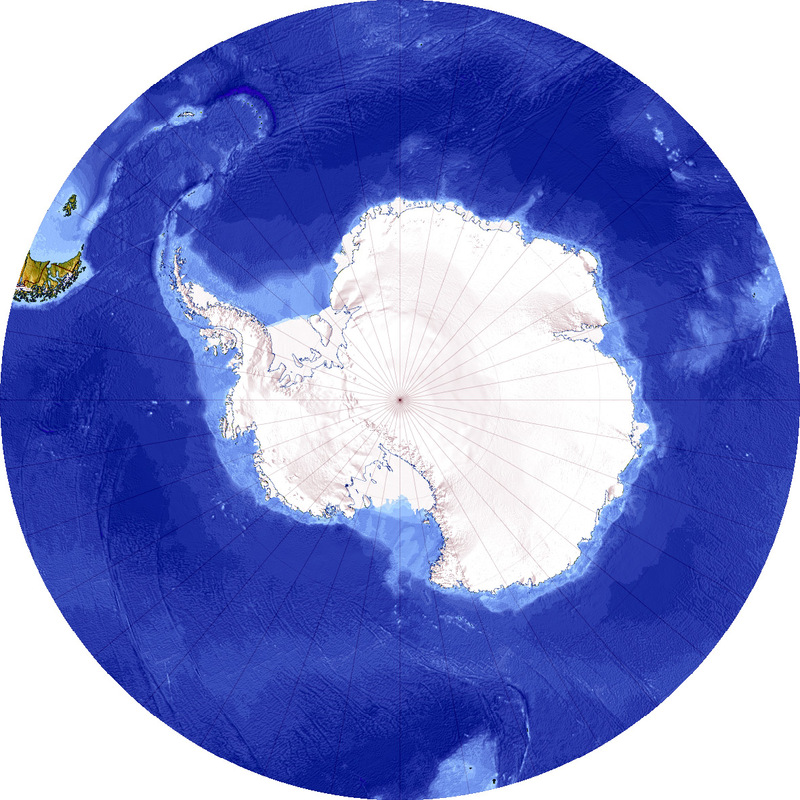 The US Amundsen-Scott South Pole Station is established by air over 1956-1957 for the International Geophysical Year. The station has been continually occupied from then to the present. January 4, 1958 - Edmund Hillary, January 19, 1958 - Vivian Fuchs, with their own parties are the first to reach the Pole overland since Amundsen and Scott during the Commonwealth Trans-Antarctic Expedition. 1987 - First tourists flown to the pole. December 30th, 1989 - Arved Fuchs and Reinhold Messner are the first to cross Antarctica via the South Pole without animal or motorized assistance, they use only skis pulled by kites.